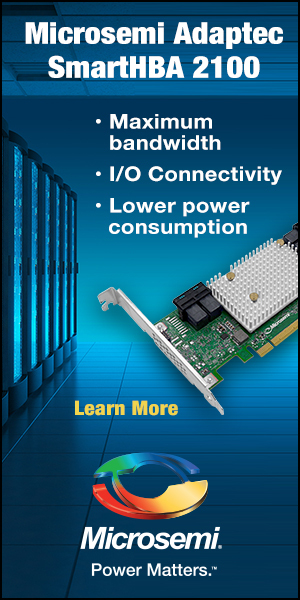 There are three constants evident in the storage industry in recent years, these being increased performance, increased capacity and lower pricing. We could probably include such things as product build quality and warranty in this, however, those three features traditionally have made up that golden triangle. The consumer wants value. They need a higher capacity and with media quality and resolution increasing significantly, performance is a must. 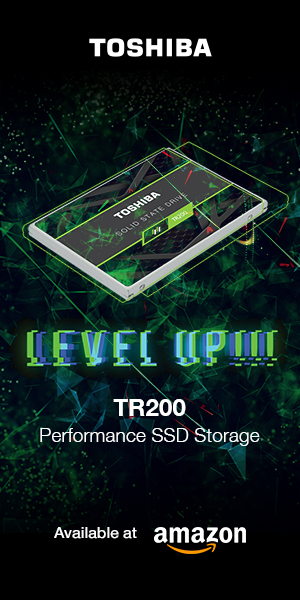 Portable SSDs provide the added benefit of data mobility and security, in that, media professionals can back up their work on-the-go, with storage of a much higher capacity, a smaller footprint and much faster than just a few years back. 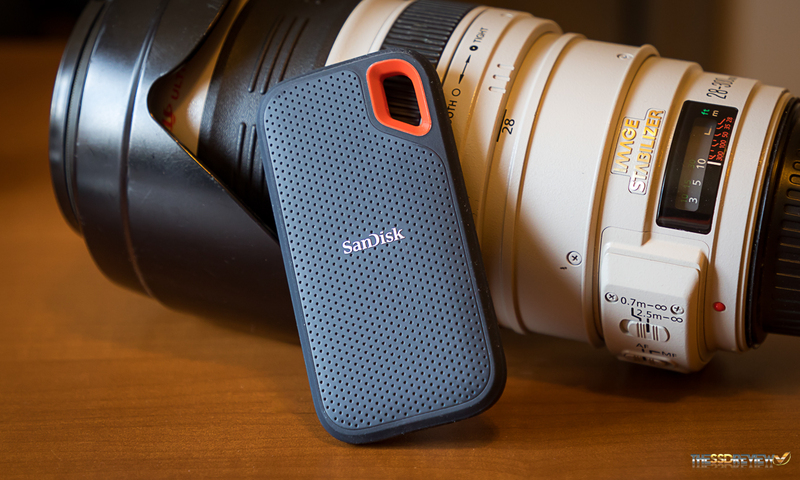 Our report today takes a close look at the SanDisk 1TB Portable SSD which is a very good example of all of these qualities…and then some. This SSD moves that line in the sand just a bit further by adding water and dust resistance to the IP55 standard, along with it being shockproof. The SanDisk Extreme Portable SSD is available in 250GB, 500GB and 1TB capacities and is USB Type-C product that is compatible with Mac or Windows. It is capable of data transfer up to 550MB/s and is ideal for storage, transfer and editing of high-resolution photos and video. 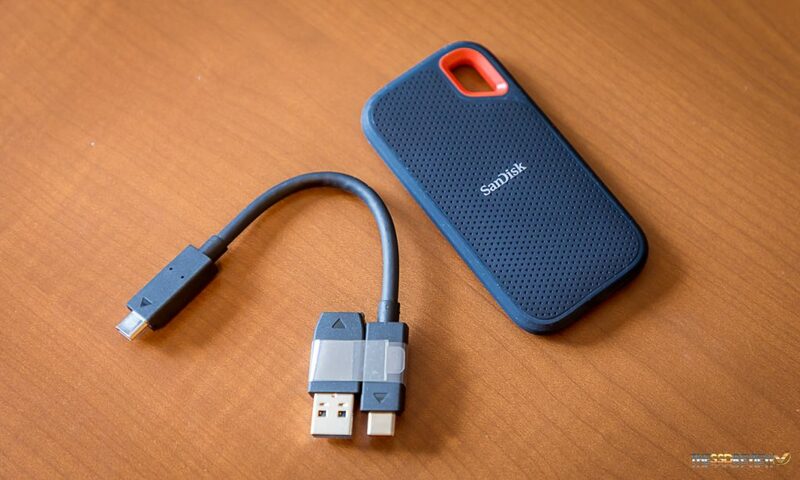 It is one of the smallest storage devices available and is water and dust resistant to the IP55 standard, as well as being shock proof and tested at drops of 2 meters. It is very small, measuring only 1.95″ x 3.79″ x .35″ and has a very smooth rubber exterior with orange plastic loop on the top right. 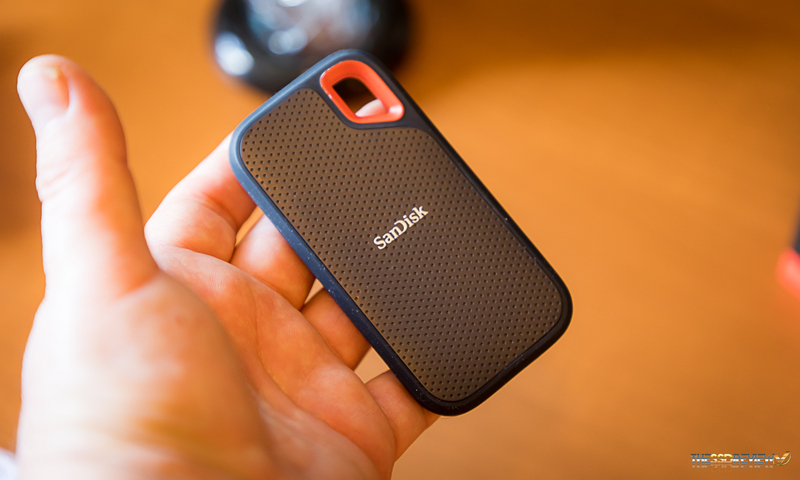 Quite frankly, this is the absolute best feel we have experienced for pocket-size portable storage. This is also one of those extremely rare occasions that we won’t be disassembling the device to identify the hardware inside, and furthermore, SanDisk’ policy is such that they won’t identify what is inside the unit. 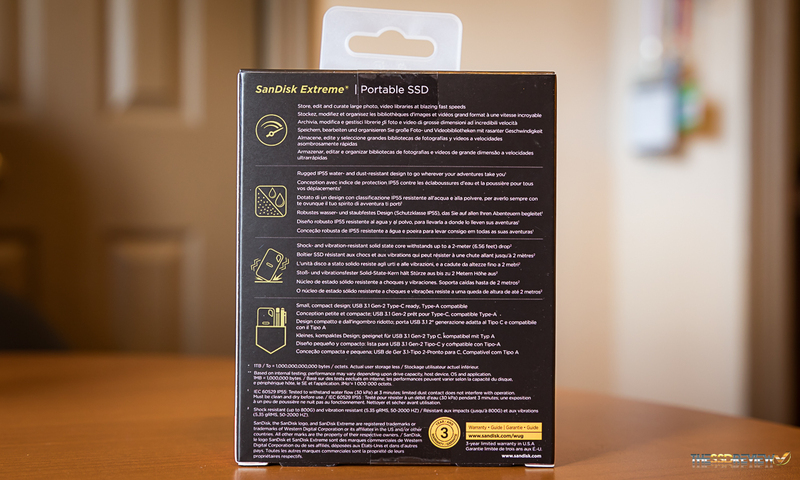 Inside the packaging, we find the Extreme Portable 1TB SSD, a USB Type-C to Type-C connector and a USB Type-C to USB 3.1 Type-A adapter. Using the Type-A adapter reduces transfer speeds somewhat which we will demonstrate in just a bit. 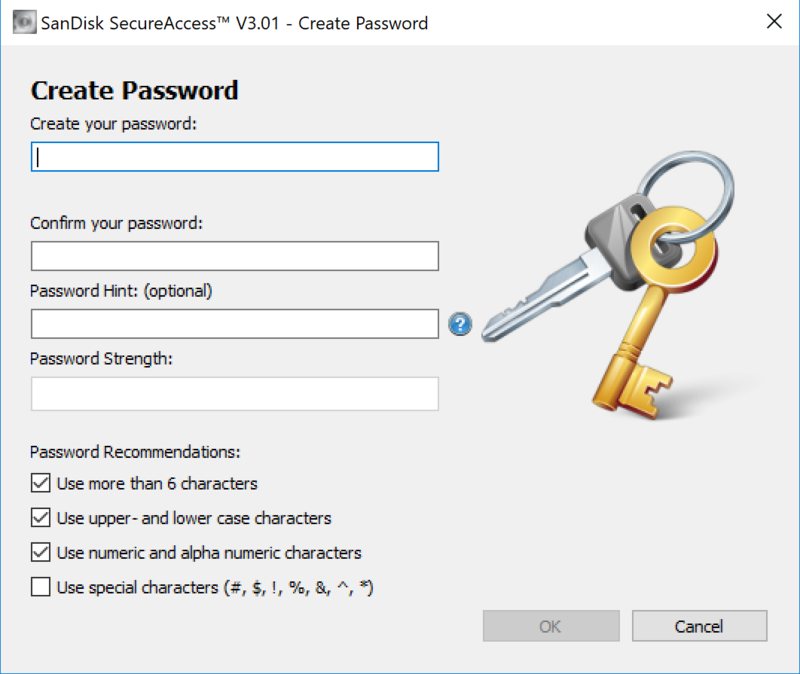 As an added bonus, the SanDisk Extreme Portable includes SanDisk Secure Access 3.0 software which allows secure storage of data up to 128-Bit AES encryption in just a few quick steps. 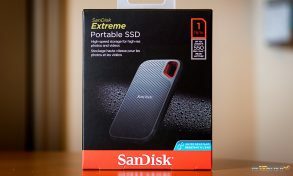 Checking out pricing of the SanDisk Extreme Portable SSD, we found it available at Amazon for $99 (250GB), $169 (500GB) and $349 for the 1TB version we are reviewing today. The SanDisk Extreme Portable SSD also comes with a 3-year limited warranty should any mishaps occur.